Enjoy the warm sunny days of spring and summer by packing a lunch and heading outside to have a picnic. This no-sew DIY picnic blanket is the perfect accessory to use all season long–use it for picnics in the park or lounging in the sun with a book at the beach. To start, tie the end of the string to a pencil or a piece of chalk. Cut the string so that you have 30 cm of string from the end of the pencil. Fold your fabric in half lengthwise, and then in half widthwise. Find the corner that's the center of your fabric and hold the end of the string in that corner. Stretch out the string from the corner and trace an arc from one side of the fabric to the other to outline the circle. Use sharp scissors to cut out the circle. Throw out the excess fabric. This step is optional and is done to give a more the blanket a more dramatic edge. If you are not comfortable with painting, you can skip this step. An alternative to a painted border is to use a more expensive ribbon with a larger fringe in the next step. Cut 2" off the end of your string. Measure to find the center of your blanket, which is 30" from the edge. In the middle of the fabric place the end of the string. Once again, stretch out the string and draw a full circle on the fabric with your pencil. You've now drawn your border. Using a ​paintbrush, paint between the pencil line and the edge of the fabric using black acrylic paint to create a solid 2" border. To achieve a clean painted edge, first apply the paint carefully to the pencil line. Once the painted edge is done, you can paint in the rest of the area between the traced line and fabric edge. Make sure to apply thin coats of paint to ensure the paint is applied evenly. Allow the paint to dry completely. Place the ribbon around the edge of the fabric. Cut off any excess. Use hot glue or fabric glue to attach the fringe ribbon to the edge of the circle. You may find it easier to pin the ribbon around the circle to hold it in place while you glue it down, removing the pins as you attach the ribbon. The glued ribbon will hide any slightly uneven or fringed edge on the canvas fabric. Allow the glue to dry completely. 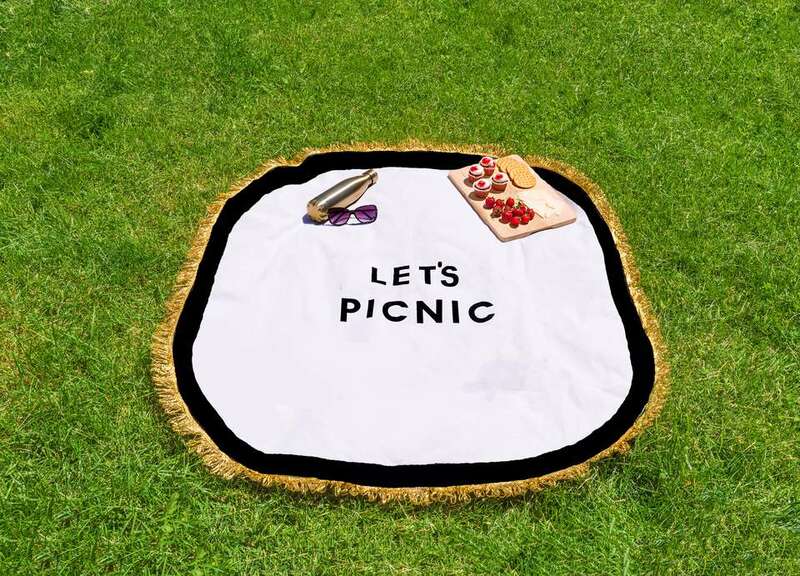 Position the letters for "Let's Picnic," or whatever phrase you choose to use in the center of the picnic blanket. Measure the space of each letter to be sure they are exactly in the center of the blanket and evenly spaced. Once you are happy with the placement of the letters, set your iron to the temperature suggested on the iron-on letter packaging. Remove the plastic backing on the first letter and press and hold the iron down on the letter until it has adhered to the fabric. Repeat this process with each letter until they are all stuck to the fabric. Once the blanket is done, go ahead and pack your cooler full of drinks and sandwiches and head out for a picnic with your family! To protect the fringe and vinyl letters, make sure to hand wash or place your picnic blanket in the delicate cycle of the washing machine. Wash only when it is dirty and allow the fabric to air dry or place it on the low setting in the dryer.